A mother. A daughter. Three possible dads. A trip down the aisle you'll never forget! Mamma Mia! has become a global entertainment phenomenon, which has now been seen by over 60 million people worldwide, in over 400 major cities. The original West End production of Mamma Mia! is now celebrating 16 years and over 6,000 performances in London, and the blockbuster feature film adaptation is the most successful movie musical of all time, grossing over $600 million worldwide. The stage show has set the record for premiering in more cities worldwide faster than any other musical in history, from Toronto to Broadway, going home to ABBA ’s original Stockholm home in a Swedish-language production in 2005. Mamma Mia! 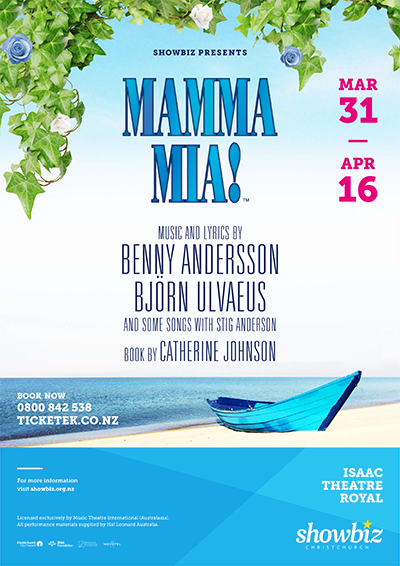 now comes to Christchurch so we can thrill in the experience, and discover why people all around the world have fallen in love with the characters, the story and the music that make Mamma Mia! the ultimate feel-good show! Writer Catherine Johnson's sunny, funny tale unfolds on a Greek island paradise. On the eve of her wedding, a daughter's quest to discover the identity of her father brings 3 men from her mother's past back to the island they last visited 20 years ago. The story-telling magic of Swedish supergroup ABBA's timeless songs propels this enchanting tale of love, laughter and friendship, and every night everyone's having the time of their lives! Featuring a wealth of original ABBA hits including Money, Money, Money, Thank You For The Music, Mamma Mia, Chiquitita, Dancing Queen, Knowing Me, Knowing You, The Winner Takes It All , and many more. Mamma Mia! is a musical celebration that will have you dancing in the aisles! 2pm Saturday Matinee April 2. Sunday Matinees, 4 p.m April 3, 10.